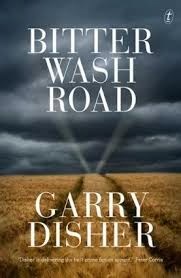 Bitter Wash Road is Australian crime writer Garry Disher's strongest work to date. It comes pretty close to Peter Temple's classic The Broken Shore in achievement. It's not your average crime thriller. It's a social critique of considerable substance. As well, it has a strong coherent plot, beautifully resolved. Disher invokes a genuine country Australian atmosphere in all its dry unforgiving hardness. The menace is so thick you could cut it with a knife. We're talking territory not far from Snowtown here - a dark, backward place, where deviance thrives. The main character, Hirsch, is a former whistle blower in the detective division of the South Australian police force, and hated. He's been demoted, shoved back in uniform and shunted to a one-man hole miles from nowhere to the north of Adelaide. His police colleagues in the wider region are mean, dumb, ugly and threatening. It's a brutal, racist and sexist culture. And Hirsch's reputation for 'treachery' proceeds him. Hirsch uncovers massive corruption, murder and paedophilia. The region's farming, commercial and legal establishment, as well as senior police, are all involved in some way. But Hirsch is no push-over. He's got courage, moral and physical, in spades. After being served up so many lame and deeply irritating main protagonists in the recent rash of new fiction from Australia's 'iconic' literary novelists over the last few months it is just so refreshing to be presented with a sympathetic main character who can credibly be described as a hero. If you've not read any of Disher's Wyatt or Peninsula thrillers then Bitter Wash Road is by far the best introduction to this major writer you could read. I can't recommend it highly enough.